Ah, sudoku, you saucy little minx you. You think you can beguile the world with your pert little numbers and mesmerizing grid, but let me tell you something, honey, you’ve been the queen of the number puzzle world for a long time now, and you’re starting to look a little tired. So don’t look so surprised when hot young things like Cohabit start to come onto the scene and muscle in on your style. Admittedly, I don’t think Cohabit is going to steal away sudoku’s limelight anytime soon, but if you’re looking for a fresh number puzzle challenge, then Cohabit is worth a look. The gameplay is simple and familiar, but it adds a new layer of mind-bending complexity to the process. 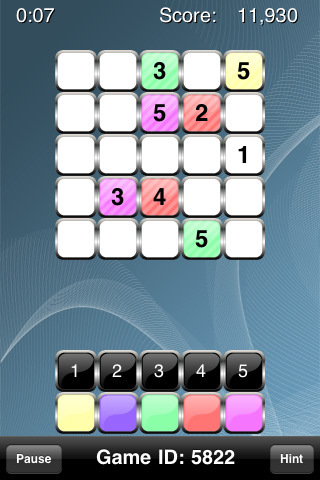 Cohabit works, in almost every way, just like sudoku, but in addition to arranging numbers into unique lines, you’re also dealing with colors. Choose your grid size, starting with 3×3 up to 7×7. From there, you’ll have a familiar set of numbers to arrange, but there are colored backgrounds to assign as well. Wait, what? Colors?! Think of it like one sudoku laid on top of another. In addition to the numbers, each row and column have to contain a complete and unique set of colors. Additionally, every letter and color pairing must also be unique. For example, if you place 2 on a green background, you cannot place a different 2 on a green background anywhere else in the grid. It sounds complicated, but the basic premise is actually pretty easy to pick up. What’s harder is convincing your brain to keep track of all these new patterns. It takes a little while to get the hang of things, and until that point, it’s easy to miss even obvious mistakes, but it is a fun little challenge. While the concept itself is solid, the main drawback to Cohabit is the presentation. The graphics are minimal and appropriately unobtrusive, but they err rather too much on the side of industrial bland. The music is also some kind of generic spaced out background beat, which isn’t offensive, but it’s also nothing special and adds nothing to the experience. I also wasn’t a big fan of the number/color entering interface, which has you tap the color or number you want to enter and then the square you want. I would have much preferred the reverse, tapping the square and then the number/color. It’s a minor gripe, but one that came up constantly. And while there is Facebook Connect, I would have really liked to have seen some online leaderboards with times on them, instead of the nebulous stats page with percentages and averages. All told, it’s not a bad little puzzle game, but it could use some polish. It’s not going to be a sudoku killer, but for people looking for a little more spice in their daily number puzzle routine, then Cohabit’s a good buy. AppSafari review of Cohabit was written by Tracy Yonemoto on November 24th, 2010 and categorized under App Store, Featured, Games, Puzzler. Page viewed 3141 times, 1 so far today. Need help on using these apps? Please read the Help Page.